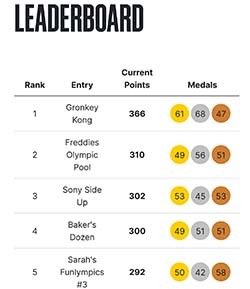 Start your Olympics Pool Today! Every two years, even those that don't regularly follow sports tune into the Olympic Games. Whether they tune in to follow swimming or table tennis (Summer Olympics) or Ice Hockey or Curling (Winter Olympics), there is something special about the sense of nationalism the Olympics generates. Now you can feel the Olympic spirit even more by running your own pool for the Winter Olympics. Members are given 300 credits. 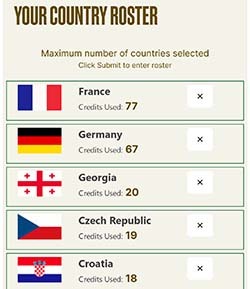 Credits are used to create a roster of countries. 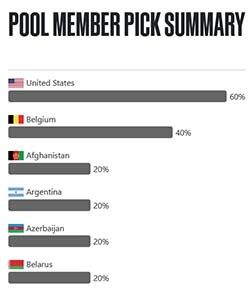 Countries more likely to win medals cost more credits. Members may have as few as 3 countries or as many as 10 on a roster. Points are awarded each time a picked country wins a medal (3 points for Gold, 2 points for Silver, 1 point for Bronze). The winning roster is the one with the most points at the end of the Olympics. Why Use Our Pool Management Service? No need to collect pick sheets. Your members login and pick online. No more pick sheet errors. Our pick sheet prevents your members from forgetting to pick a series winner or a series length. No more calculating scores. Pool standings are automatically updated. No more waiting for results. All reports and standings are updated real-time. The price to continue using the service is based on the number entries in your pool. The following price tier structure is your one-time fee for the entire 2019 Winter Olympics! NOTE: An "entry" is considered a member's submission of one complete set of picks. 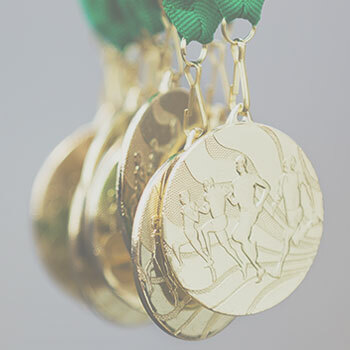 Olympics Pickem pools can be an excellent promotional opportunity for your business, raise money for a charity, or fund-raise for a youth sports team. It's ABSOLUTELY FREE to add your company or organization logo to customize the look of your Olympics pool. For more information, see our Brand Your Pool page. Start your Winter Olympics pool with us today. If you have any additional questions, please contact us via e-mail. We're happy to answer any questions you may have.